it was bound to happen sooner or later...At last you can now play Doctor Who Monopoly. The board game, which is limited to just 5000 sets, features all your favourite heroes, villains, monsters, planets and places from the worlds of Doctor Who. The game will be available to buy from 31st August 2011, priced £29.99, but our friends at Forbidden Planet are currently offering it for the discounted price of just £26.99. 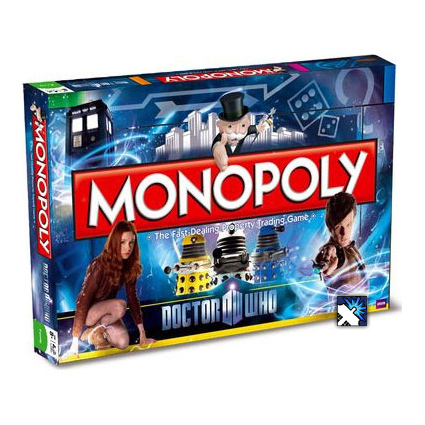 + Preorder Doctor Who Monopoly for just £26.99 from Forbidden Planet! 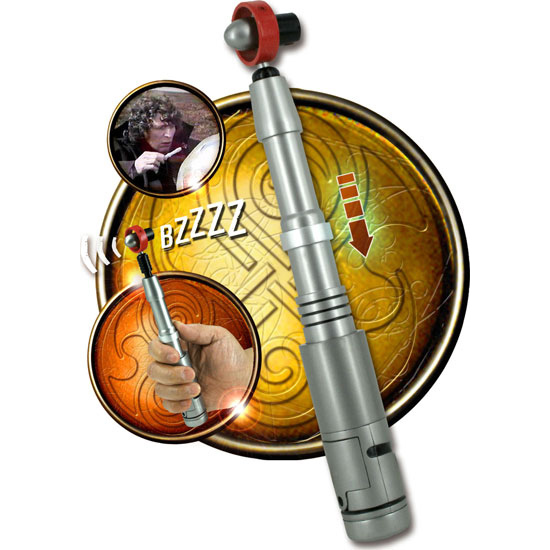 The 4th Doctor's Sonic Screwdriver is an electronic version of the Fourth Doctor's Sonic Screwdriver with 2 sounds and spring loaded sound activation. The Sonic Screwdriver is a versatile tool and defensive device first used by the Doctor in his second incarnation for opening up hatches, panels and controls. Later uses included cutting through wall sections and even as a conventional screwdriver. During the Fourth Doctor's reign, he remade yet another similar style of Sonic Screwdriver but with many more features and functions including micro soldering of circuitry, cutting wires and bulkheads and even detonating Dalek explosives. + The 4th Doctor's Sonic Screwdriver is Out Now, priced £19.99. The final BARB viewing figures are in for 6.1: The Impossible Astronaut. The episode achieved a final figure of 8.86m viewers, with an audience share of 43.3%. This is the biggest ever time shift for Doctor Who, and one of the biggest ever for BBC One with a +2.4 Million shift. The overnight viewing figures are in for 6.2: Day of the Moon. The episode achieved a figure of 5.4m viewers, with an audience share of 30.5%. Doctor Who was the second most-watched programme for Saturday, with Britain's Got Talent taking the top slot with 9.5m viewers. The BBC Doctor Who website have uploaded a teaser to their prequel for Episode 3 of Series 6. The teaser offers a short 30-second insight into the full prequel which will air after 6.2: Day of the Moon, exclusively on the BBC Doctor who website at 6:45pm. + 6.3: The Curse of the Black Spot airs on Saturday 7th May 2011 at 6:15pm on BBC One. 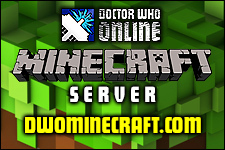 The BBC Doctor Who website have added The Game of Rassilon to their Games section. Legends tell of a Time Lord challenge that would test the guile, intelligence and fortune of those brave enough to step forward. The challenge was known as The Game of Rassilon. This is not an Adventure Game but a series of games that test your knowledge of Doctor Who. Featuring clips, images, exclusive new footage with Matt Smith, Karen Gillan and Arthur Darvill plus other members of the cast and crew, the games are not to be taken lightly. You'll be able to challenge your friends or take the test in solitude. + Play The Game of Rassilon. 6.2: Day of the Moon, doesn't immediately pick up from where last week left off, however. The final moments of the previous story are revisited in a fragmented form which feels more like a stylistic resolution than what we have come to accept from traditional cliffhangers. We're also treated to one of the longest pre-title sequences in the show's history - over 6 and a half minutes in total! As with our previous preview, it's an incredibly difficult episode to describe without giving too much away, but we can tell you that it's set 3 months after the events in The Impossible Astronaut, there's another prison with The Doctor's name on it and there are more shocks here than the previous episode. Day of the Moon actually feels a little more complex than The Impossible Astronaut, even with a couple of answers to some niggling questions (no, not THAT question…yet) - your brain will literally hurt after the 45 minutes are up. Moffat displays once more just how talented he is on every level, delivering a story that takes the show to new exciting levels and possibilities. But the cherry on this proverbial cake of an episode comes in the final minute - in a scene that will have you screaming through your television set in a way that makes Maureen Lipman's portrayal of 'The Wire' look diluted. May the nail biting begin…AGAIN! 1) Rory's addiction to a little red light. 2) A certain picture in a frame. 3) 2 body bags filled with people The Doctor cares about. 4) River makes a splash! 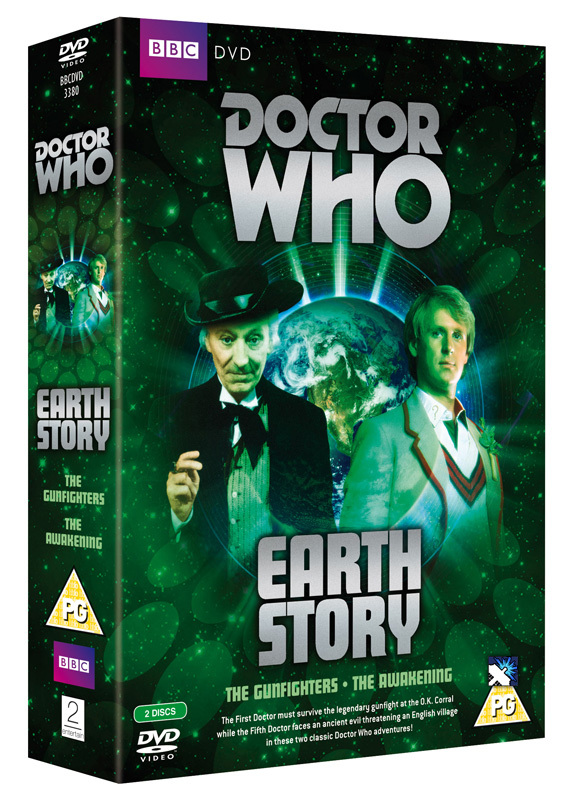 2|Entertain have sent DWO the cover and details for the Doctor Who DVD box-set release of EarthStory. 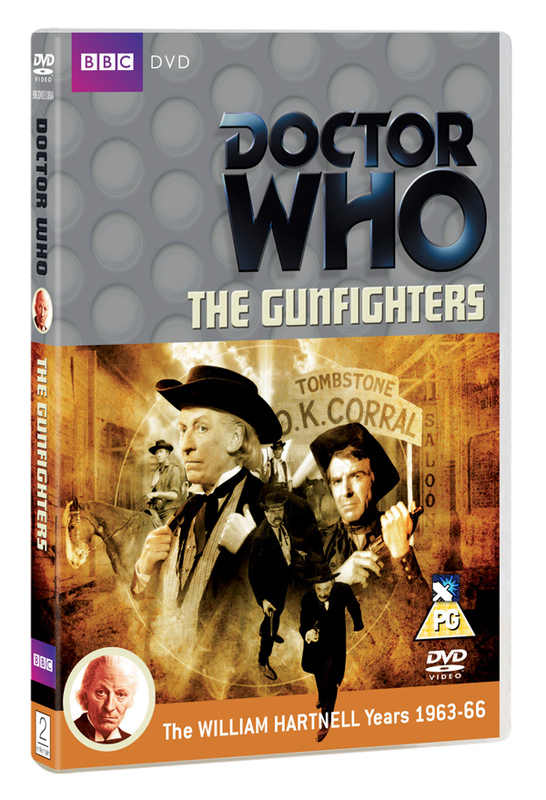 Take a trip to the Wild West in The Gunfighters, when the TARDIS arrives in Tombstone, Arizona in 1881. The Doctor, suffering from toothache, seeks out the local dentist - the notorious Doc Holliday. Tensions are running high between the feuding Clanton family and Doc Holliday, whilst the local lawman, Wyatt Earp, struggles to keep the peace. 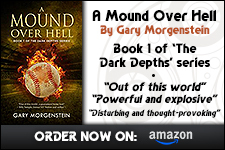 When legendary gunman Johnny Ringo comes to town, events start to escalate. 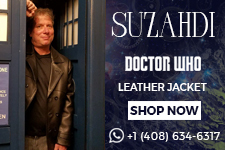 Can the Doctor, Steven and Do do do anything to stop the situation getting any worse? Or will there be a gunfight at the OK Corral? • Commentary - with actors Peter Purves, Shane Rimmer, David Graham and Richard Beale, production assistant Tristan de Vere Cole and moderator Toby Hadoke. • The End of the Line – After two years on the screen, Doctor Who had become a television phenomenon, regularly reaching an audience of ten million viewers. But with a change of producer and script editor and the looming prospect of losing the lead actor, the programme’s third year was the one that would make or break it… With actors Maureen O’Brien, Anneke Wills and Peter Purves, script editor Donald Tosh, new series writer Gareth Roberts and long time Doctor Who viewer Ian Levine. • Tomorrow’s Times – The First Doctor – looking at the newspaper coverage of Doctor Who during the programme’s opening years. Presented by Mary Tamm. • Photo Gallery - production, design and publicity photos from the story, set to the entirety of ‘The Ballad of the Last Chance Saloon’. The TARDIS has brought the Doctor, Tegan and Turlough to the picture postcard English village of Little Hodcome. Tegan has come to visit her grandfather - well known local historian Andrew Verny - but he seems to be missing. The residents of Little Hodcombe, led by the obsessive Sir George Hutchinson, are playing a vicious war game - an exact recreation of a battle of the English Civil War fought there in 1643. • Commentary - with actor Michael Owen Morris and script editor Eric Saward, moderated by Toby Hadoke. • Now & Then – the latest in the ongoing series visits the villages of Martin, Shapwick and Tarrant Monkton to compare the locations used in the story with how they appear today. • From the Cutting Room Floor – extended and deleted scenes from a timecoded VHS of the original edit and unedited film sequences, plus location action from the film rushes. • The Golden Egg Awards – the inadvertent destruction of a prop lychgate by a horse was the winner of The Late Late Breakfast Show’s Golden Egg Award. Peter Davison is on hand to collect the trophy from host Noel Edmonds. • Isolated Music – option to view the story with the isolated music score. + The EarthStory Box-set is released on 20th June 2011, priced £30.63. Doctor Who star, Matt Smith has been nominated as Best Actor in this years BAFTA Awards for his role in Doctor Who. It is to be noted that this is the first time an actor who has played The Doctor, has ever been nominated in the role, and will be going head-to-head with Sherlock star, Benedict Cumberbatch. + The awards take place on Sunday 22nd May 2011. The overnight viewing figures are in for 6.1: The Impossible Astronaut. The episode achieved a figure of 6.5m viewers, with an audience share of 36.7%. Doctor Who was the second most-watched programme of Easter Saturday, with Britain's Got Talent taking the top slot with 9.5m viewers. The DWO WhoCast Doctor Who Podcast is covering the New Series as soon as it airs each week. The podcast, which is available weekly for FREE from iTunes and the DWO WhoCast website , will be moving to Saturday evenings whilst Series Six airs, and immediately after each episode has finished, you can find the latest episode of the DWO WhoCast online, with a review of the most recent adventure. So at 6:45pm Tonight you will find Episode #190 available for download with our review of 6.1: The Impossible Astronaut. ** Don't forget to Rate / Discuss each episode of the DWO WhoCast in the DWO Forums! + Subscribe to the DWO WhoCast via iTunes. + Download the iWho App for just £1.19, complete with DWO WhoCast Episodes! Tom Baker's Big Finish Now Underway! Tom Baker's Big Finish debut is underway! 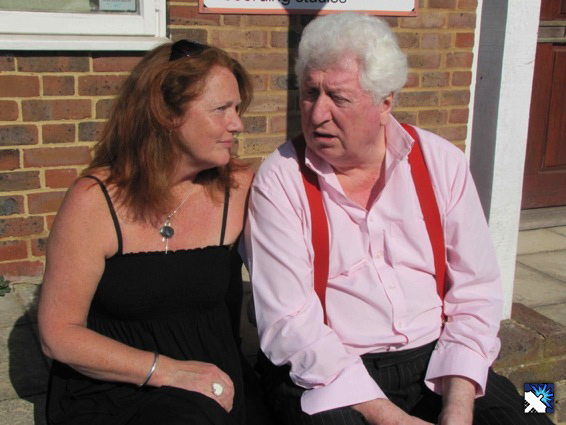 Recording commenced at 10am on Friday 22nd April on Big Finish’s The Fourth Doctor Adventures, starring Tom Baker and Louise Jameson. The first six-part audio series debuts on CD and download in January 2012, and pre-orders are already available at www.bigfinish.com. Big Finish have sent DWO a photo [pictured right] showing Tom and Louise enjoying the Easter sun before recording commenced with Scene 2, INT TARDIS with the Doctor and Leela.